On a vacation in Rabat, a World Heritage Site and Morocco's capital, you can discover the city's long and rich history while enjoying a laidback atmosphere, less touristy than in the booming Casablanca and Marrakech. Rabat is known for historic sites, museums, parks, zoos & aquariums, and beaches. Your plan includes some of its best attractions: steep yourself in history at Kasbah des Oudaias, take in nature's colorful creations at Les Jardins Exotiques de Bouknadel, wander the streets of Rabat Old Town, and don't miss a visit to Mausoleum of Mohammad V.
For maps, reviews, traveler tips, and tourist information, go to the Rabat trip planner . Casablanca to Rabat is an approximately 1-hour car ride. You can also take a train. When traveling from Casablanca in September, plan for slightly colder days and somewhat warmer nights in Rabat: temperatures range from 26°C by day to 26°C at night. Finish up your sightseeing early on the 21st (Fri) so you can go by car to Fes. Get out of town with these interesting Fes side-trips: Ifrane National Park (in El Hajeb) and Meknes (Moulay Idriss Zerhoun & Bou Inania Medersa). There's much more to do: admire the striking features of Bou Inania Medersa, make a trip to Medina of Fez, take a stroll through Fes el-Bali, and admire the natural beauty at Jardin Jnan Sbil. To see more things to do, other places to visit, ratings, and more tourist information, go to the Fes road trip planning tool . You can drive from Rabat to Fes in 2.5 hours. Other options are to take a train; or take a bus. Traveling from Rabat in September, you will find days in Fes are a bit warmer (37°C), and nights are a bit cooler (19°C). Finish your sightseeing early on the 26th (Wed) so you can drive to Tangier. Separated from Spain by the Strait of Gibraltar, Tangier remains a mix of North African, French, Spanish, and Portuguese cultural influences. 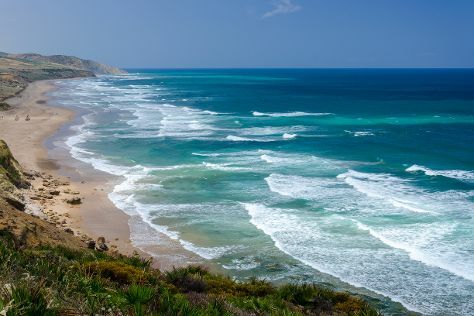 Venture out of the city with trips to Asilah (Puerto de Assilah, Paradise Beach Kaf Lahmam, & more). There's much more to do: kick back and relax at Tangier Beach, Head underground at Hercules Cave, make a trip to Musee de la Kasbah, and see the interesting displays at American Legation. For more things to do and other tourist information, refer to the Tangier road trip planning tool . You can drive from Fes to Tangier in 4 hours. Alternatively, you can take a train; or take a bus. When traveling from Fes in September, plan for slightly colder days and about the same nights in Tangier: temperatures range from 32°C by day to 21°C at night. Finish your sightseeing early on the 1st (Mon) so you can drive to Chefchaouen. Tourism in Chefchaouen, a picturesque town in the Rif mountain range, has been thriving for decades due to its scenic surroundings and buildings painted in a striking blue hue. 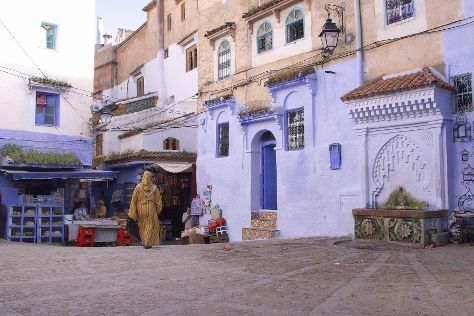 Kick off your visit on the 2nd (Tue): take in the spiritual surroundings of Grand Mosque, make a trip to Place Outa el Hammam & Kasbah, and then get to know the fascinating history of Chefchaouen Medina. On your second day here, stop by Local Berbere Artisanal, get engrossed in the history at Kasbah Museum, and then admire the sheer force of Cascades d'Akchour. To see reviews, maps, ratings, and more tourist information, read our Chefchaouen planner . Traveling by car from Tangier to Chefchaouen takes 2 hours. 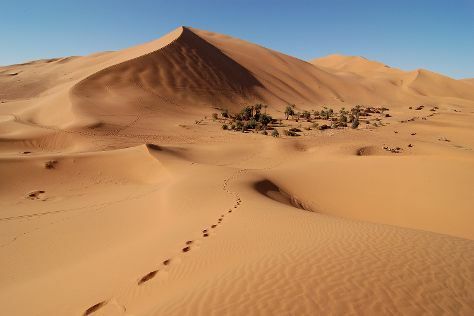 Cap off your sightseeing on the 3rd (Wed) early enough to travel to Erg Chebbi. 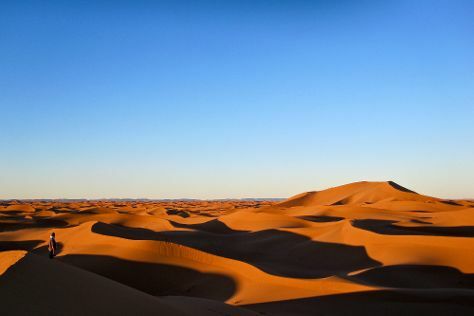 Kick off your visit on the 4th (Thu): hit the best photo ops around with an inspiring photography tour and then explore the striking landscape at Erg Chebbi Dunes. To see traveler tips, reviews, ratings, and more tourist information, you can read our Erg Chebbi day trip planning website . Traveling by car from Chefchaouen to Erg Chebbi takes 10.5 hours. Alternatively, you can fly. In October, plan for daily highs up to 33°C, and evening lows to 19°C. Finish your sightseeing early on the 4th (Thu) to allow enough time to travel to M'Hamid. Start off your visit on the 5th (Fri): explore the fascinating landscape at Bivouac sous les Etoiles and then admire nature's extreme beauty at Atmospher Erg Chigaga. On the 6th (Sat), you'll have a packed day of sightseeing: savor the flavors at Miami Beach Chocolates and then don't miss a visit to Esprite-Lamane. To find maps, ratings, more things to do, and tourist information, read M'Hamid itinerary maker . Traveling by car from Erg Chebbi to M'Hamid takes 5.5 hours. Wrap up your sightseeing by early afternoon on the 6th (Sat) to allow time for travel to Oukaimeden. 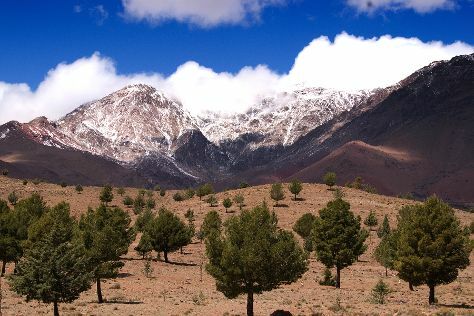 Kick off your visit on the 7th (Sun): take your sightseeing to a higher altitude at High Atlas Mountains. Get ready for a full day of sightseeing on the 8th (Mon): glide through natural beauty at Oukaimeden. To see reviews, ratings, and more tourist information, you can read our Oukaimeden road trip planning site . Drive from M'Hamid to Oukaimeden in 9 hours. Wrap up your sightseeing on the 8th (Mon) to allow time to travel to Marrakech. Change things up with a short trip to Le Paradis du Safran in Ourika (about 48 minutes away). There's still lots to do: admire the natural beauty at Jardin Majorelle, admire the striking features of Bahia Palace, soothe aching muscles at some of the top local wellness centers, and admire all the interesting features of Menara Gardens and Pavilion. For photos, traveler tips, ratings, and more tourist information, you can read our Marrakech trip planner . Traveling by car from Oukaimeden to Marrakech takes 2 hours. In October in Marrakech, expect temperatures between 34°C during the day and 19°C at night. Cap off your sightseeing on the 16th (Tue) early enough to go by car to Essaouira. Essaouira is known for beaches, spas, adventure, shopping, and classes. 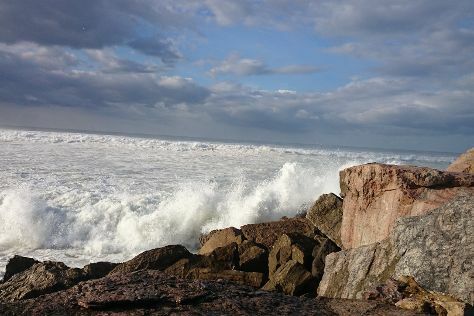 Your plan includes some of its best attractions: wander the streets of Medina of Essaouira, enjoy the sand and surf at Essaouira Beach, get outside with Kaouki Surf School, and don't miss a visit to Essaouira Ramparts. For other places to visit, photos, traveler tips, and more tourist information, you can read our Essaouira vacation maker . Getting from Marrakech to Essaouira by car takes about 2.5 hours. Other options: take a bus. Traveling from Marrakech in October, expect nights in Essaouira to be about the same, around 20°C, while days are slightly colder, around 28°C. Wrap up your sightseeing on the 21st (Sun) to allow time to drive to Agadir. Completely rebuilt after a catastrophic earthquake in 1961, the coastal city of Agadir rose from the ruins and grew into Morocco's premier beach destination. Agadir is known for beaches, parks, spas, historic sites, and shopping. Your plan includes some of its best attractions: enjoy the sand and surf at Plage d'Agadir, contemplate the long history of Agadir Kasbah, don't miss a visit to Seafront promenade, and tour the pleasant surroundings at Crocoparc. To see ratings, other places to visit, where to stay, and other tourist information, go to the Agadir route planner. Traveling by car from Essaouira to Agadir takes 3 hours. Cap off your sightseeing on the 25th (Thu) early enough to travel to Casablanca. Change things up with these side-trips from Casablanca: Asala (in Mohammedia) and Mazagan Golf Club (in El Jadida). Plan for a day of cool, family-friendly fun on the 28th (Sun) at Tamaris Aquaparc. There's much more to do: admire the landmark architecture of Hassan II Mosque, visit a coastal fixture at Phare d'el Hank, make a trip to Old Medina of Casablanca, and take a memorable drive along The Corniche. To find reviews, other places to visit, ratings, and more tourist information, refer to the Casablanca tour builder tool . Do a combination of flight and train from Agadir to Casablanca in 3 hours. Alternatively, you can drive; or take a bus. In October, plan for daily highs up to 30°C, and evening lows to 21°C. Wrap up your sightseeing by early afternoon on the 31st (Wed) to allow time for travel back home.